A Bengali meal is incomplete without a chutney. A formal Bengali meal starts with a bitter preparation and ends with a sweet and sour chutney, with different dishes like dal, sukto, vegetable curries, fish or meat preparations, served in between. Serving chutney along with papor (a deep fried wafer made from either lentil or sago) signals the final part of the meal, where different sweets are served, ending the meal with a sweet note. One can enjoy this kind of grand meal during the ceremonial occasions. We do not follow this elaborate meal structure for our daily routine, but it's a common practice to have little chutney even after a simple meal of rice and fish curry. 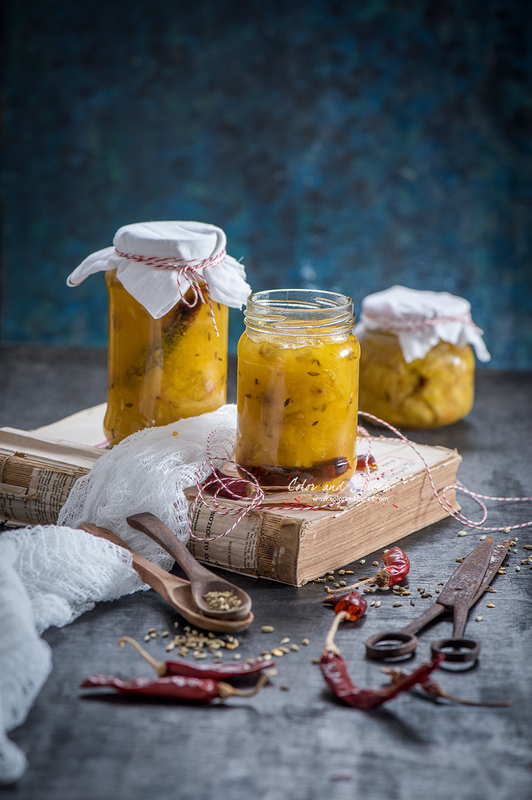 Chutneys are made from all possible ingredients, from seasonal fruits to vegetables to fishes, which is served and relished during the final part of a meal. Today I prepared a pineapple chutney. 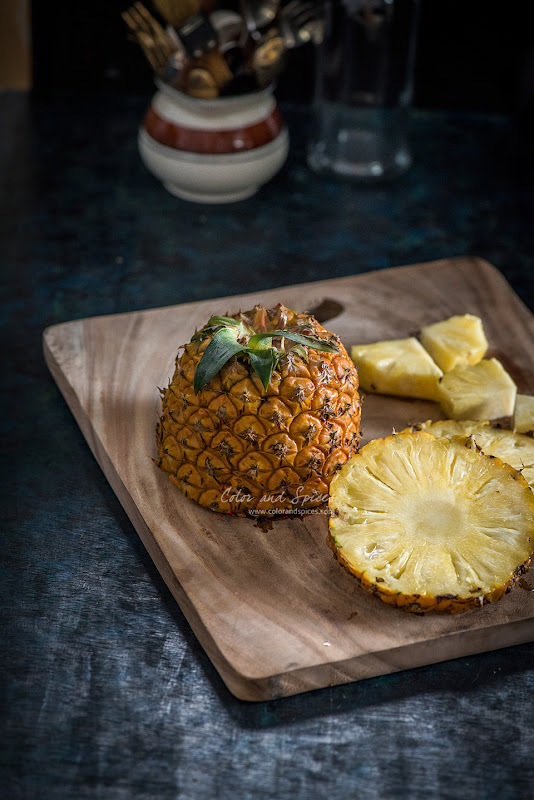 I absolutely love pineapple, as a fruit or as topping on my pizza or some grilled pineapple slices served with a dollop of ice cream. Though I love this fruit, I find it pretty difficult to cut this spiny fruit. 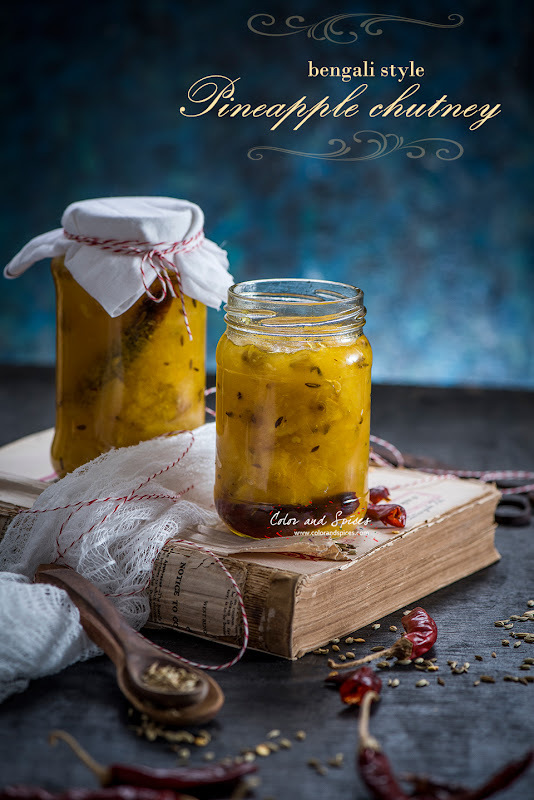 I prepared a typical Bengali style pineapple chutney or Anaros er chutni as we call it. I used fresh pineapple as they are in season now, canned pineapple can also be used. 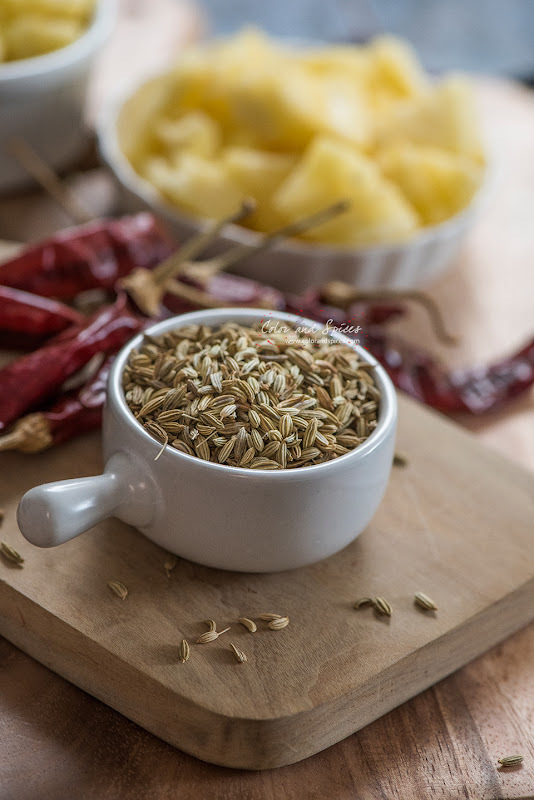 This chutney is flavored with fennel seeds and dry red chilies. 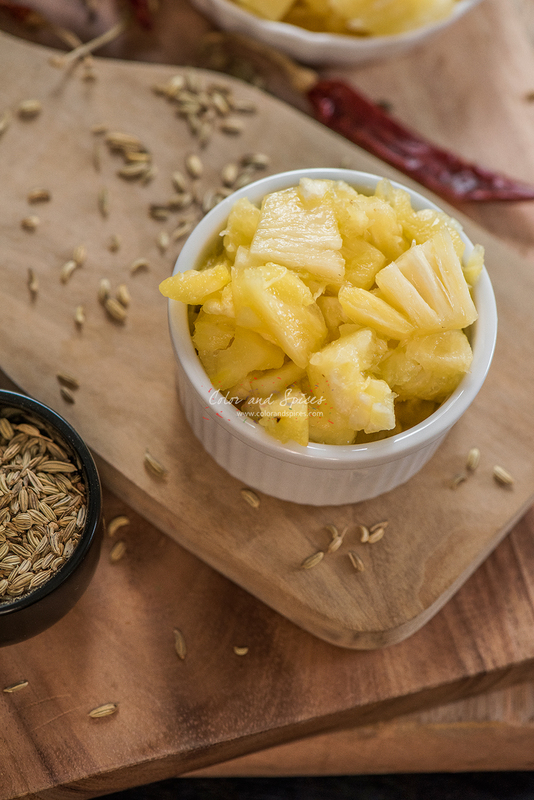 The flavor of fennel with sweet and tangy pineapple is a perfect match. 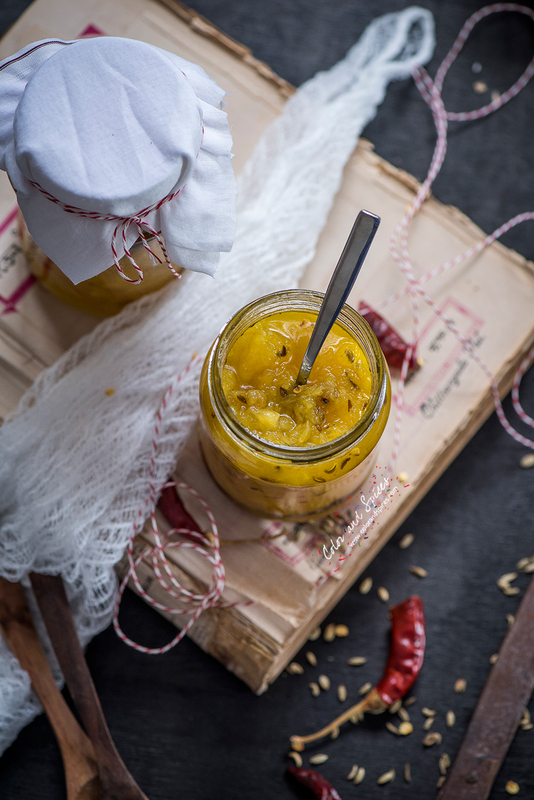 For this chutney the pineapples can be cut into small chunks or grated. It can be done both ways, depending on one's choice. If you roughly chop the pineapple into small pieces the chutney will end look like the above image. And it nice to bite into some chunky pineapple pieces. 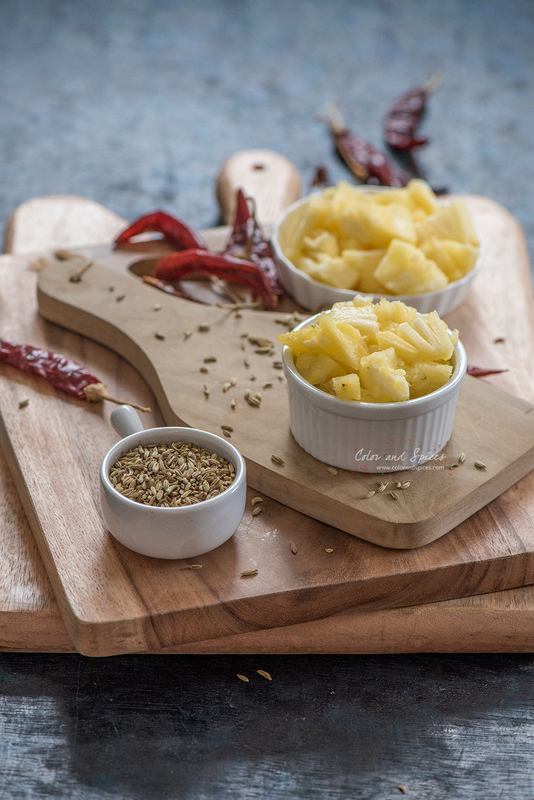 If you grate the pineapple then it results to an awesome texture, I personally prefer to grate the pineapple. 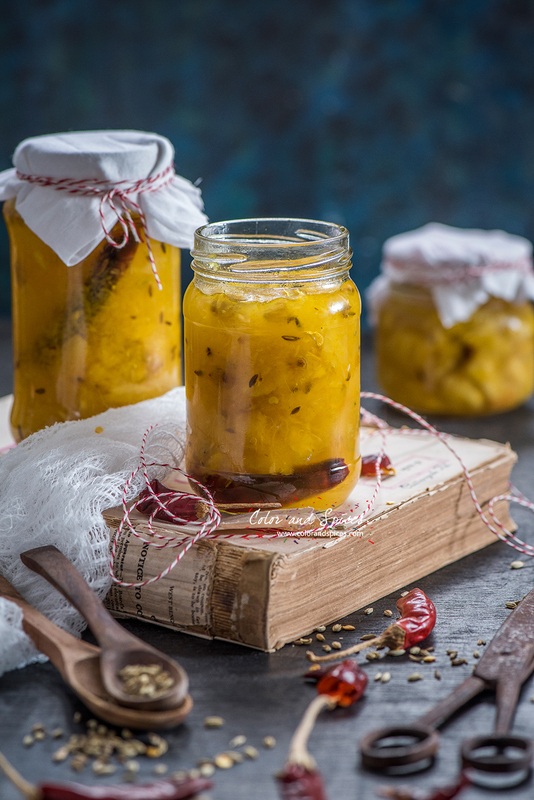 I like to make few bottles of the chutney while fresh pineapples are in season and I store them in air tight glass jars. This way I can either gift a jar of chutney to someone or enjoy the fruit anytime of the year. 1. Roughly chop or grate the pineapple into small pieces. Collect all the juices released while chopping or grating the fruit. 2. In a pan heat oil, I used mustard oil but any other vegetable oil can be used. 3.When the oil is hot add fennel and dry red chilies. As the seeds change color add the chopped or grated pineapple along with the juices. Add a pinch of turmeric powder and salt, mix well. 4. Add sugar. 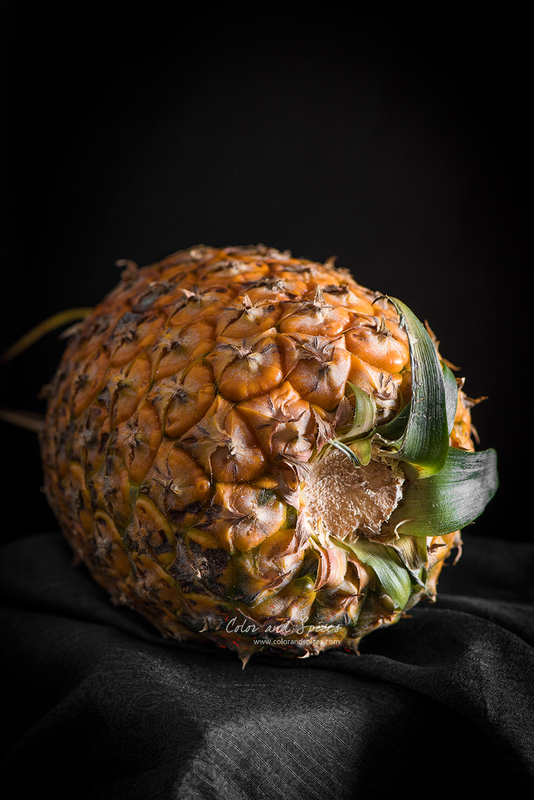 The amount of sugar depends on the tartness of the pineapple. The pineapple I used was very tart so I needed almost 2 cups of sugar. 5. As the sugar melts, add soaked raisins, cover and cook the for 10 mins. .
6. Switch off heat, add lime juice and let the chutney cool down. Transfer into a glass jar with lid. IN THIS HECTIC LIFE TODAY PEOPLE MOSTLY EAT PINEAPPLE RAW, WHY TO LABOR AND MAKE A CHUTNEY, SUCH ITEMS ARE RESERVED FOR CEREMONIAL OCCASIONS AS YOU HAVE POINTED OUT IN THE TEXT,MOST LADIES ARE NOW WORKING LADIES AND THEY HAVE TO TAKE LEAVE FOR SUCH FOOD ITEMS. 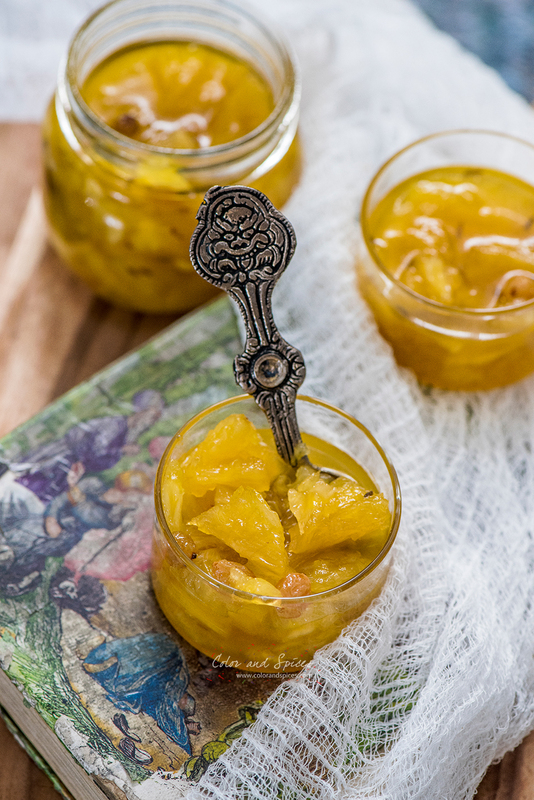 Pineapple or any fruit chutney is so so delicious and I love how you've made this. Mandatory with roti or rice. Pretty pretty pictures my dear.